Walter P. Chrysler finished the new Chrysler Building in 1930 and quickly started looking for air conditioning equipment. Most equipment at the time was too large and expensive so he decided to create his own. Some of the advancements they came up with was a new high-speed radial compressor, capacity regulators, and self-contained units. 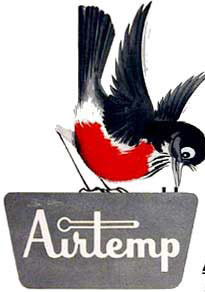 During World War II Airtemp provided air conditioning for hospitals and other critical operations as well as making bomb shackles, field kitchens, and parts for several guns. After they created an new plant, which was completed in 1947, producing window units, condensing units, and commercial refrigeration. In 1963 they bought Therm-O-Rite Products Ltd of Toronto and renamed it Chrysler Airtemp Canada Limited. On February 23, 1976, Chrysler sold Airtemp to Fedders.